All good things come to an end at some point, even Law and Order and Mr. Rogers' Neighborhood. 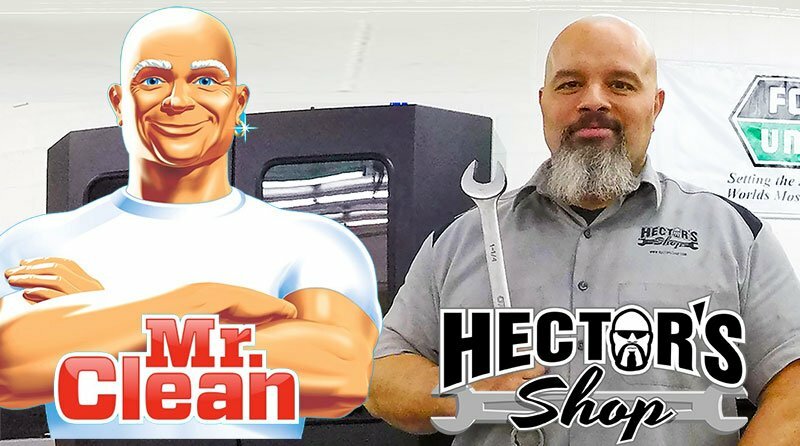 After almost 100 episodes over an eight-year run on TurfNetTV, Hector Velazquez is closing Hector's Shop as we know it and moving on to the next challenge in educating turf equipment technicians, whatever and wherever that may be. On the heels of an epic week hosting Inside the Shop at GIS2019, receiving the Edwin Budding Award and appearing on Good Morning San Diego, Hector decided to seize the moment and springboard to something new. "I appreciate the experience I was able to gain from my time with TurfNet. I've learned a lot with your help and really am grateful," Hector said. "My wife and I are excited about what the future holds for my family, even though we're not sure at this point what that is or where it will be. The only thing I know is that I want to continue helping equipment technicians." The Velazquez family is not afraid to pull up roots and find a new adventure. In 2015, Hector took Hector's Shop and his family on the road and spent the next four years crisscrossing the country while living in an RV and homeschooling their seven children. Along the way he worked on a temporary basis at several golf courses, did onsite tech training, extreme makeovers, shop organization consultations, speaking engagements and hands on classes. "Hector's Shop on Tour was an amazing experience for me and my family, allowing us to see and experience parts of the country and meet people that we never would have been able to otherwise," Hector said. "But after four years on the road, we are ready to settle down. We are looking for property now, preferably with a shop on it already." Awards Hector has won representing TurfNet in TOCA's annual contests. Peter McCormick of TurfNet said, "There is little doubt that Hector has done more over the last eight years to elevate the stature of the turf equipment technician than anybody else, ever. He has trumpeted the value of a clean, organized shop, shown us how to paint a shop floor properly (even sprinkling on some glitter), how to properly use basic to the most specialized tools, and has introduced little-known tools, techniques and gadgets to broaden the skill set of the equipment tech. His influence on the industry has been huge." ...Hector has done more over the last eight years to elevate the stature of the turf equipment technician than anybody else, ever. Speaking of huge, anyone who has met Hector and shaken his catchers-mitt-sized hands knows that he has spent time in the gym. He is an imposing presence. An early Tips & Tricks video Hector did for us back in 2010 while he was the equipment manager at Westwood Country Club in Vienna, VA.
"One of the most enjoyable things for me while working with Hector over the years has been the masterful way in which he has built his personal brand," said McCormick. "From the evolution of his logo (to currently include his caricature) to his signature bowling shirts, a professional branding agency could not have done a better job than Hector has done for himself. I wouldn't be surprised to see him pitching products on TV or hosting a show like This Old House or NPR's Car Talk some day. He has an open road ahead of him." A future for Hector as a pitchman, or as Bob Vila for equipment techs? Of note is the fact that Hector produced all of his videos himself, learning the nuances of lighting, camera and audio gear, and editing applications along the way. Hector's influence has not gone unnoticed outside the turf industry. He was recruited several years ago to produce 50 videos for Home Depot's tool rental department, and has worked with the Equipment & Engine Training Council (EETC). For the son of a preacher from New Jersey with little formal training in mechanics -- and none in video, audio or marketing for that matter -- Hector has done an amazing job. We wish him and his family nothing but the best... and Keep Those Zerks Greased.